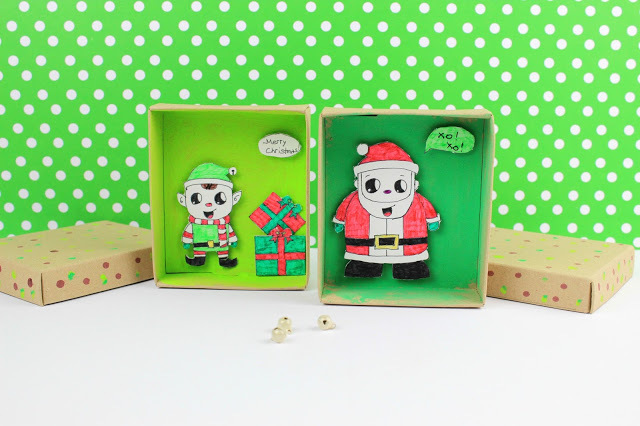 Diy Christmas Comic Wishing Boxes ! 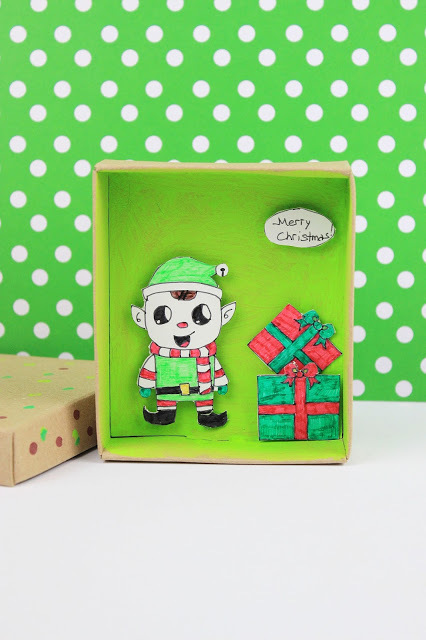 Prepare your own cute wishing cards with a funny style for this Christmas! We wish you a Merry Christmas…we wish you a Merry Christmas… yes, I know, it is not Christmas yet, but we are counting and we are thrilled about it! This is the season we love most! Home is full of aromas and tiny lights, our Christmas tree is full of color and small ornaments, Christmas songs play all the time and I love the aroma of hot chocolate in my house! Every year we are trying as a family to spend these days doing absolutely nothing, except playing, crafting, dancing, singing, having fun! And by saying crafting, I mean handmade gifts and wishing cards to our friends! But for this year, I have so many beautiful cards to present to you… oh yes! Each card is so amazing and unique and you will definately find your style! 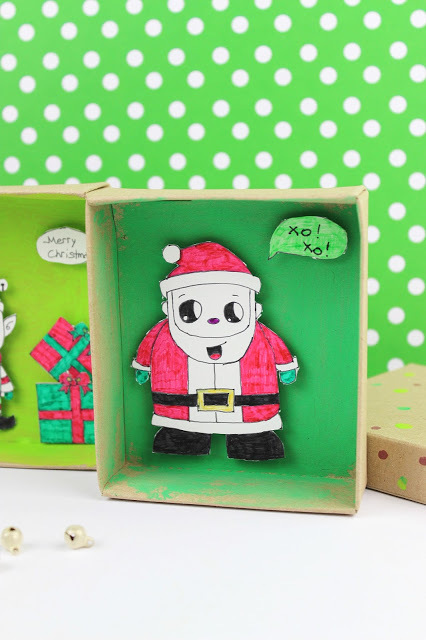 10 ladies, 10 cards and this post is full of Christmas! Are you curious??? This year, our cards are already in progress and are different than the usual cards. Actually they are Wishing Boxes! 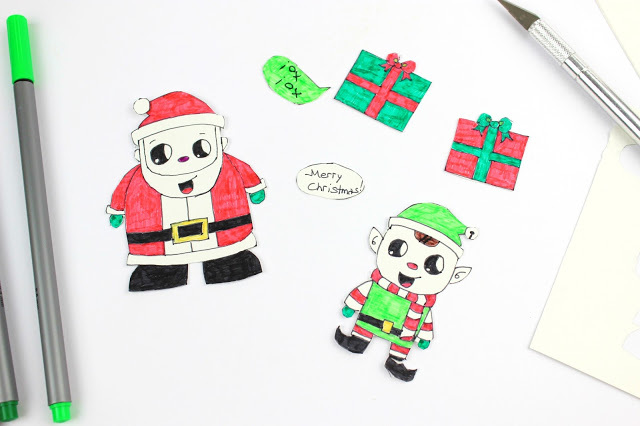 I have to admit that I do not know how to draw a line, so imagine how happy I am when we found with my princess in youtube, videos about how to draw simple comic characters and then our little Santa Claus and his little helper were ready! I was so thrilled, that I have done a few of them! The procedure is really easy after that. 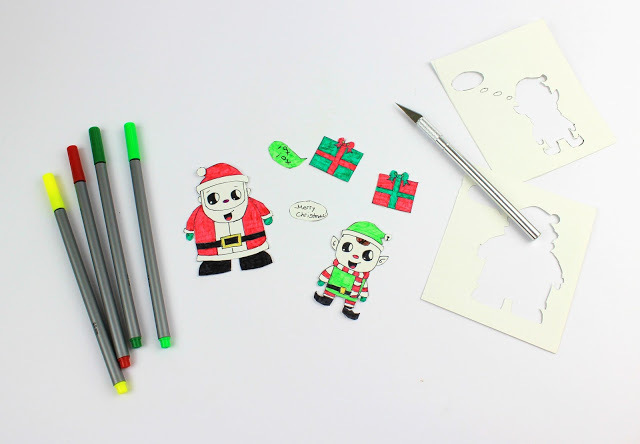 Just draw your comic character or anything you wish, to a white cardboard and cut it with a paper cutter. Paint them and add some color! Let’s put aside the paintings and prepare our box now. Jewelry boxes or any small box you wish to use. If the box is already painted, then there is nothing to do, except maybe to add some beautiful details like ribbons. 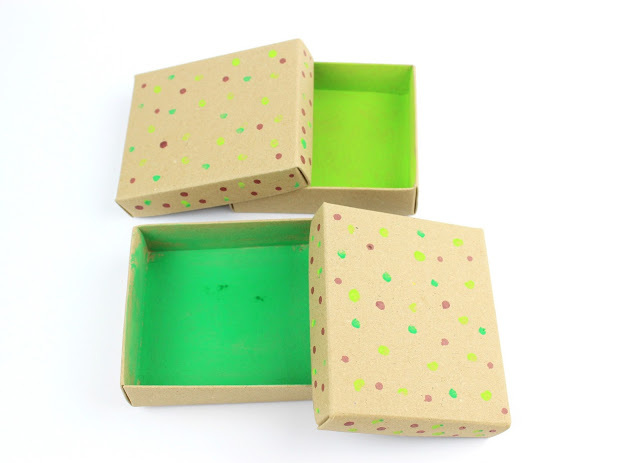 Our boxes were recycled with the typical smoky brown, so polka dots in green and bright green and red were just perfect! Acrylic paint and a cotton swab and let the kids to do the rest of the work. Allow it to dry for a while. Our Wishing Boxes are almost ready! Just use 3D foam with glue on the back of your comics and put them inside the boxes. If you are not able to find this 3D foam cubes, just use plastic buttons and glue in the same way. Close the boxes and decorate them again with a ribbon. And we are done! Every year the wishing cards are handmade with the help of my princess (yes, this year the prince will also help us) and it is part of our Advent Calendar of course…actually tomorrow is the day to prepare with the kids, cards for their friends! So if you liked this idea, I want to share more ideas of beautiful and unique handmade Christmas Wishing Cards!!!! Aren’t they gorgeous??? Find the how to do procedure by clicking the collage above or download them by clicking here!!!! 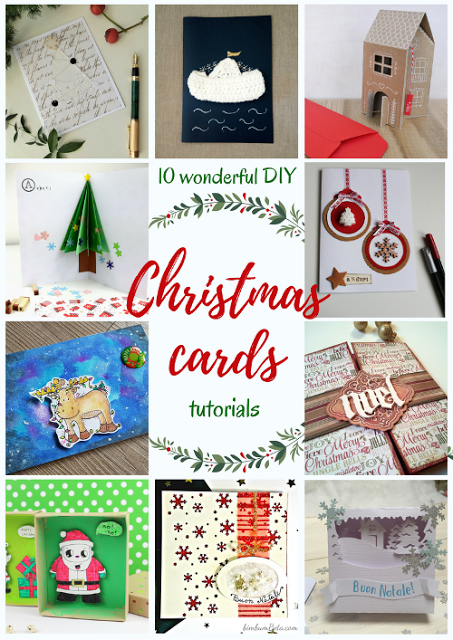 A small gift from us to you for the Christmas… an ebook with 10 amazing tutorials for Christmas Wishing Cards just for you! Also you can find it in compressed file by clicking here! Υπέροχα κουτάκια! Τα λάτρεψα! Μπήκε στη to do list μου! Καλό μήνα! Μα πόσο χαριτωμένα τα τοσοδούλικα… πόσο! I think they are amazingly cute! Thanks for that and for the link too! Thank you very much Gia!!!! Αγαπώ τις δημιουργίες σου, Ζήνα. Κάρτες και κουτάκια είναι υπέροχα! Ευχαριστούμε για το δωράκι, φίλη μου. Το "κατέβασα" και θα το διαβάσω προσεκτικά. Πολλά φιλάκια. Μια μου, χιλια ευχαριστω για τα καλα σου λόγια!!! Love your project! Thank you for sharing! Τι πρωτότυπη και χαριστωμένη ιδέα!!! Έγιναν πολύ όμορφες ειδικά με την πολύτιμη βοήθεια των μικρών σου χεριών!! Φοβερή έκπληξη για τους παραλήπτες! Δεν έχω ξαναδεί κάτι αντίστοιχο! Πάντως με τη ζωγραφική νομίζω ότι είσαστε πλέον φίλες! μπα…δεν το κατεχω το αθλημα Κατερινα! μονο με σαφής οδηγίες! A very nice idea to do with my children! Your project is adorable, it makes us return a little bit children! haha indeed…if you need to draw, which I cannot do it! thank you! Wow amazing! Soo cute your little elf. I'm gonna try your idea this weekend with my girl!! I am really glad you like it! I hope you enjoyed it also! thank you! Που πας και βρίσκεις τις ιδέες θα ήθελα να ήξερα… τελειο είναι! χαχαχα χαιρομαι που σου άρεσε! χιλια ευχαριστω! Σε ευχαριστω πολύ Δήμητρα μου!